This Blackberry Cake is my new favorite breakfast. 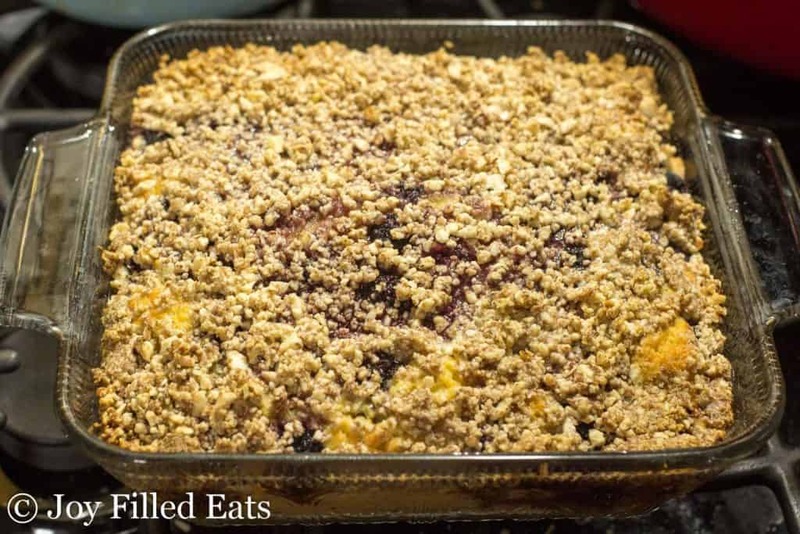 It is moist and flavorful with a crunchy almond topping. 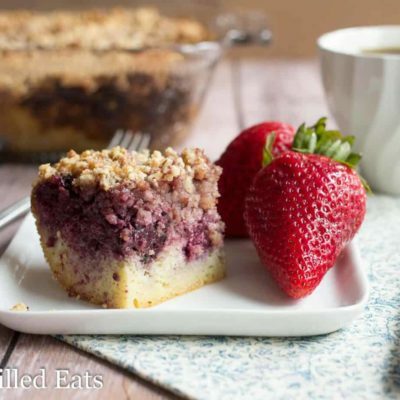 It pairs perfectly with fresh berries and a good cup of coffee. Cake for breakfast is one of the great pleasures in life. Whoever came up with coffee cake is a genius. Every good cup of coffee needs a bite or two of something sweet alongside. I know I’m not the only one who thinks that way. This is based on my Cranberry Walnut Crumb Cake from last fall. I love that cake but cranberries scream fall to me and I wanted a springier version. 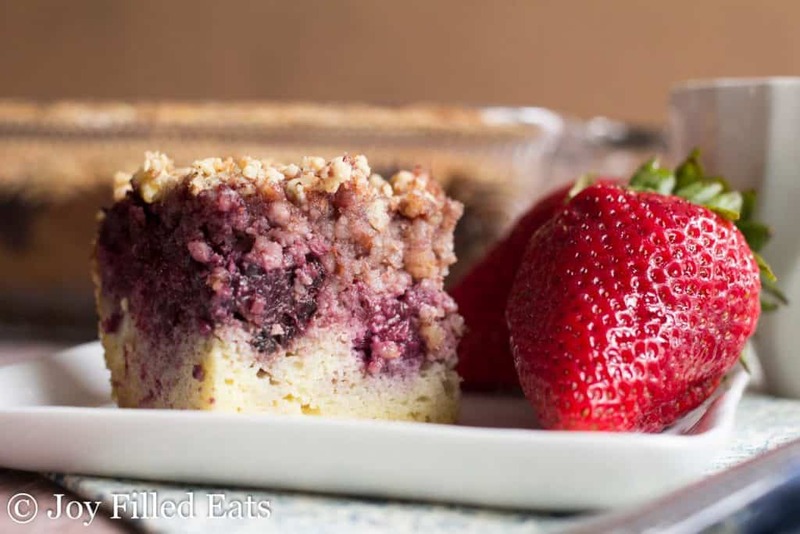 You can use any berries you like in this. I enjoyed the blackberries but the batch I had did have extra large seeds. If that would bother you choose another berry instead. Nope. My kids still can’t believe this. Coffee cake is called coffee cake because it goes well along with a cup of coffee. 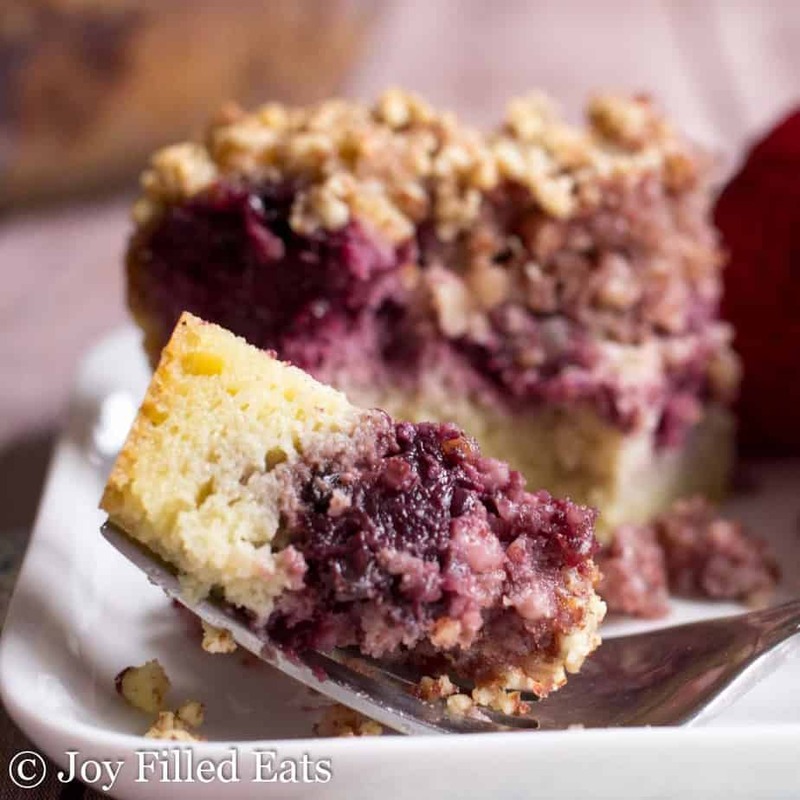 This Blackberry Cake is a traditional Coffee Cake that is lightly sweetened so it isn’t overpowering in the morning. But it is still sweet enough and enough of a treat to be a great dessert at the end of the day. The color of the blackberry juice seeping into the cake underneath is beautiful. My daughters love the color purple and this is a great way to get a naturally purple cake. I try to keep my recipes simple, with the exception of a few fancy special occasion desserts. As far as homemade, from scratch, cakes go this one is very simple. You can just mix the batter in a bowl with a wooden spoon and then dump the crumb topping ingredients in the food processor and pulse. This is delicious even without the topping if you want to simplify it further. Isn’t my new glass baking dish pretty? I use 8 x 8 glass baking dishes several times a week so when I saw this one I had to have it. It’s a nice change from the two pyrex dishes I’ve been rotating between for the last 10+ years. Coconut Milk – coconut milk helps keep dairy-free baked goods moist and tender. 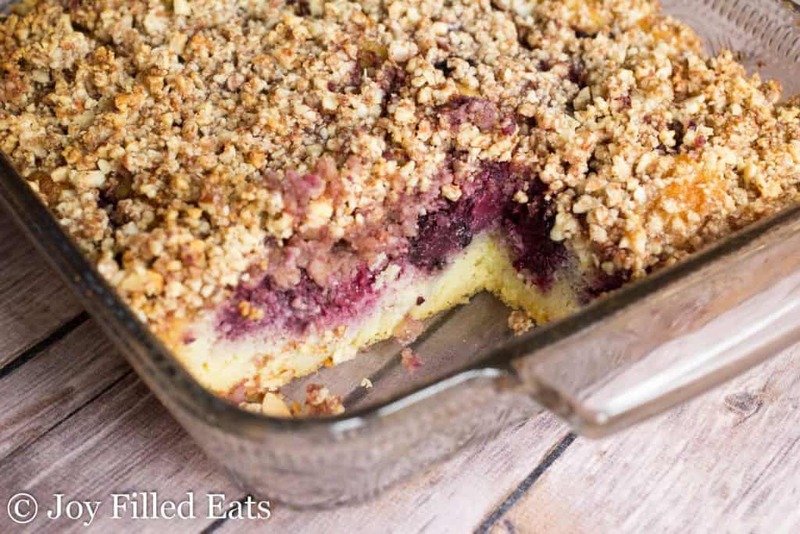 Coconut Oil – I use refined or butter flavored coconut oil in recipes that I don’t want a coconut flavor like this Blackberry Coffee Cake. 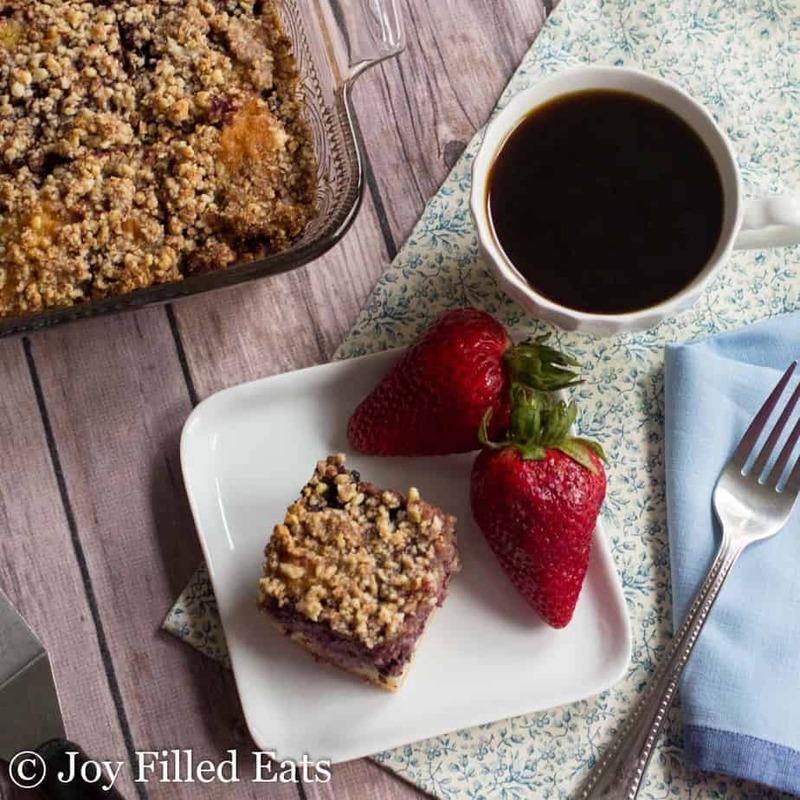 I hope you enjoy this Blackberry Coffee Cake Recipe! 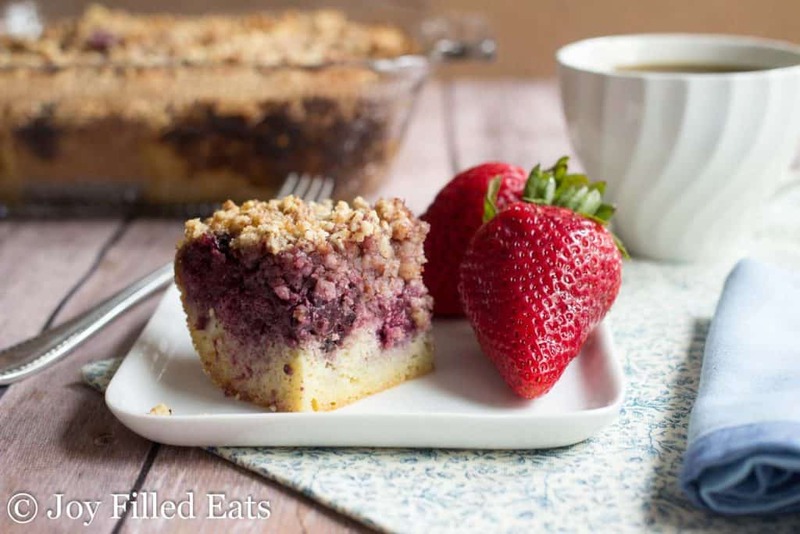 Bursting with berries this Blackberry Coffee Cake will be perfect for your brunch! Stir together the dry cake ingredients in a medium bowl. Add all the other cake ingredients and mix well with a wooden spoon. Spread in a greased 8 x 8-inch baking dish. 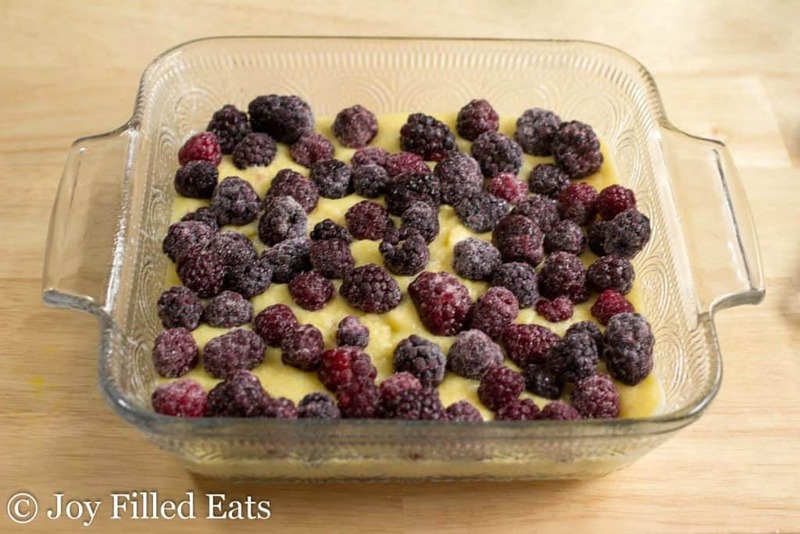 Sprinkle the blackberries on top of the cake batter. Meanwhile, combine the ingredients for the topping in a food processor. 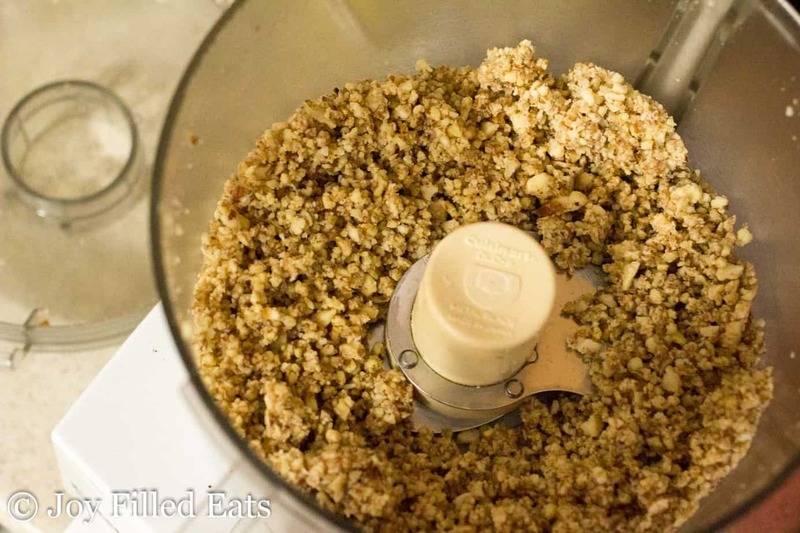 Process until the nuts are chopped and wet crumbs form. Sprinkle evenly over the partially baked cake. Bake for an additional 40-55 minutes until the cake is firm to the touch, golden, and doesn't jiggle when lightly shaken. The center should feel as firm as the edge when lightly pressed with your fingertip. Originally Published April 27, 2017. Revised and Republished March 15, 2019.
sorry- “most of my lo carb “is what i meant to say! My sweetener is twice as sweet as monk fruit blends like Lakanto. What does THM S mean? Trim Healthy Mama Satisfying. It is a common term for that way of eating. Similar to low carb. Would you recommend only using fresh blackberries, or would frozen blackberries work as well? Frozen work too. Just add them frozen, don't thaw them first. I would love to make this but I only have granulated sucralose and plain liquid stevia drops. Any suggestions? I would look up a similar cake that uses sucralose to see how much is recommended. My guess is you will need 1.5 times as much. You could also just taste the batter as you go. If wanting to just use raw cane sugar, would that still work? What amounts would you suggest? 1.5 to 2 times as much. The sweetener I use is sweeter than sugar. We can not do coconut, do you think I could change the recipe and it still work out? Do you need it to be dairy free? Looks amazing! Planning on making it for breakfast tomorrow morning. Just wanted to check what other sugar substitute would work since I don’t have the blend. I have xylitol and stevia and erythritol. Thanks! Coffee cake turned out great! Thanks! Yummm. Making this for a potluck. 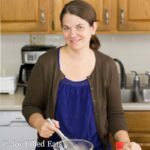 Can I use pecans or walnuts in place of almonds? I didn't realize you meant canned coconut milk. I used Silk protein milk and it turned out great! Can I use baking blend? Also almond milk for the coconut milk? Baking blend should work. I'm not sure if almond milk would. I use the full-fat canned coconut milk. Almond milk has a much lower fat content. CAN OR CARTON COCONUT MILK????? Well done on your restrained response to the above question, and for taking the time to share this lovely recipe...delicious! I'm not sure what we did wrong but it ended up very dry and had no sweetness to it at all. I'm happy to help you troubleshoot. Did you use gentle sweet? Are you sure you only used 1/4 cup coconut flour? Could you have forgotten an ingredient? This is definitely not dry. It is very moist. If the coconut flour measurement is off it can through off the whole recipe since it absorbs so much moisture. Do you use can or carton coconut milk? I used canned coconut milk. This is delicious, dense and moist! We did a mix of raspberries and blackberries and it turned out great! My daughter loves this before school in the morning. It keeps nicely in the fridge for at least 3 days and is now in our morning breakfast rotation. Thank you! This looks so delicious! Will it dry out if I bake it ahead?